Once upon a time there was a place in New York where you could wander over a soft, sand-covered floor and settle at your opulent tented table—all the while falling deeper and deeper into the hypnotic trance of a belly dancer. And starting tonight, with the opening of the new Casa La Femme in the West Village, that time has returned. 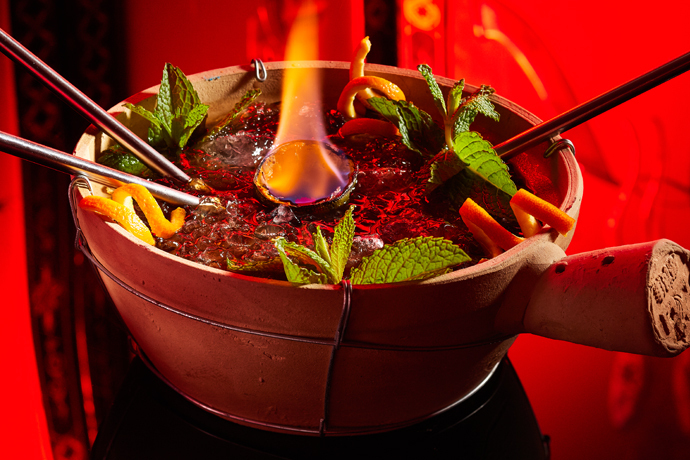 While Casa's legend as a secreted Egyptian lounging scene may precede it, the new incarnation of the former resto may be the slightly-over-the-top-kitschy-yet-somehow-still-effective date spot that you've been looking for since 2009 started. First off, make sure your date won't mind a bit of belly dancing from a Middle Eastern princess. Slip in on the later side, skip the candlelit, cream-colored front bar and settle into one of the Bedouin tent-tables in the back. Once you've gotten comfortable, ordered up some of the house-infused vodka drinks and a platter of dips and hummus, you'll want to peek outside your private little teepee and survey the scene. Sparkly, multi-colored chandeliers are everywhere (including the bathroom where it matters most), and the fireplace in the center of the room will be radiating heat and just enough light to bring the aforementioned belly dancer—who performs nightly—into focus. And you should always stay focused on what's important.